Some 120 managers of marine protected areas, marine litter experts and other stakeholders from the Mediterranean will be at the closing conference of ACT4LITTER, scheduled for October 24th at the Central Building of the University of Athens. The ACT4LITTER regional conference has drawn attendees from more than 22 countries and the European Commissioner for Environment, Fisheries and Maritime Affairs, Mr. Karmenu Vella, will address the conference audience via a video message. 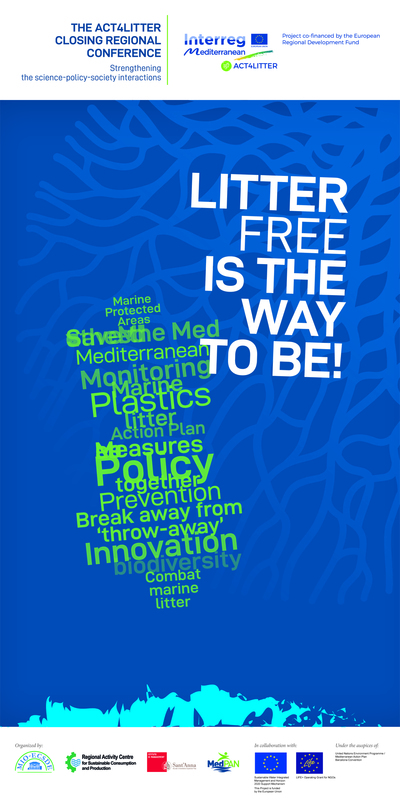 The event showcases the collective response of the Mediterranean to curb the problem of marine litter. It brings forward recent scientific advances with regards to marine litter and its impacts in the region and provides an opportunity to key stakeholder groups active on the science-policy-society interface to share their compelling stories and hands-on experiences. The conference features initiatives that address the whole management cycle of marine litter, from prevention, monitoring and surveillance to mitigation measures, carried out at European, Mediterranean, national and local level. “The way forward must go through forging partnerships for action that amplify the impact of the work of individual actors in government, civil society, scientific community, private sector, international organizations, so as to effectively promote reduction and prevention measures”, states Mr. Gaetano Leone, Coordinator of the UN Environment Programme/Mediterranean Action Plan. Special emphasis is given to litter that is building up in what should be pristine coastal and marine protected areas, where marine biota and endangered species dwell. The event puts in the spotlight the 2-year-long ACT4LITTER, an Interreg Med funded project that has provided essential support to managers of coastal and marine protected areas towards achieving their conservation objectives. MPA managers stand at the forefront of the marine litter threat and are committed to curb it. Within the framework of the project, MPA managers have become a taskforce towards gathering reliable marine litter data through the ACT4LITTER Marine Litter Watch. Through nine pilots, they have fast tracked concrete actions against marine litter which are now featured in action plans for marine litter management in their respective areas. “To date no coherent, consistent and targeted measures were taken in our areas in order to tackle marine litter. We, as MPA managers, benefited tremendously from theACT4LITTER results and outputs as these have enabled us to react quickly and effectively. In particular the project has empowered us to play an active role in raising awareness on the issue and – most importantly – in promoting concrete actions in collaboration with national and local institutions, communities, educators and schools, NGOs and other volunteers”, added Samanta Makovac, from the Public Institute Landscape Park Strunjan located in Slovenia. The collective experience of the pilot MPAs sets the baseline for a common urgent response by Mediterranean MPAs to deal with the lurking marine litter threat. This response is underpinned by a comprehensive list of showcases of marine litter measures and a fit-for-purpose decision making tool developed within the project. “We are thrilled and relieved to see that the fight against marine litter in the Mediterranean and in particular in the coastal and marine protected areas continues. Marine litter is a ‘wicked problem’ that offers opportunities to work together, do more with less, break free from bad habits and make fundamental changes towards an inclusive green growth and a circular economy”, says Prof. Michael Scoullos, Chairman of the Mediterranean Information Office for Environment, Culture and Sustainable Development. The ACT4LITTER closing conference is organized by the Mediterranean Information Office for Environment Culture and Sustainable Development, the Catalan Waste Agency – Regional Activity Center for Sustainable Consumption and Production, the Sant’ Anna School of Advanced Studies and the Network of Marine Protected Area Managers in the Mediterranean. The event benefits from collaborating with the EU-funded Sustainable Water Integrated Management and Horizon 2020 Support Mechanism and the LIFE+ Operating Grant for NGOs; and it is organized under the auspices of the United Nations Environment Programme / Mediterranean Action Plan.